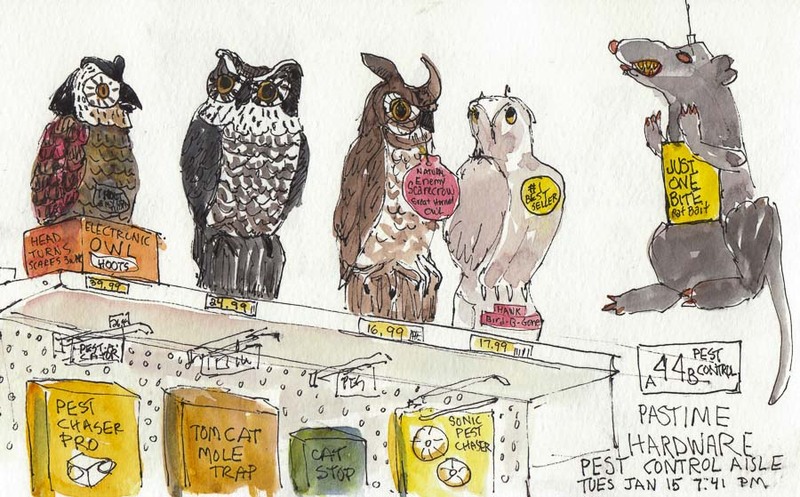 When we made our annual sketching pilgrimage to Pastime Hardware on a cold winter evening I picked the Pest Control department. I was attracted by the big, ugly, inflated hanging rat and the artificial owls who seemed to be discussing who was going to nab the rat. 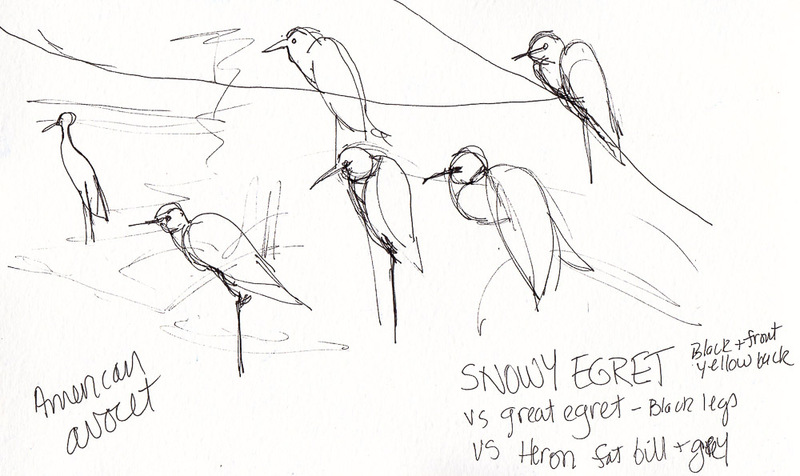 I know someone who is courting real owls by putting up owl houses in her yard. That solution might be worse than the problem. My son has a family of screech owls living in a tree across the street from him and they keep him awake, screeching all night long. 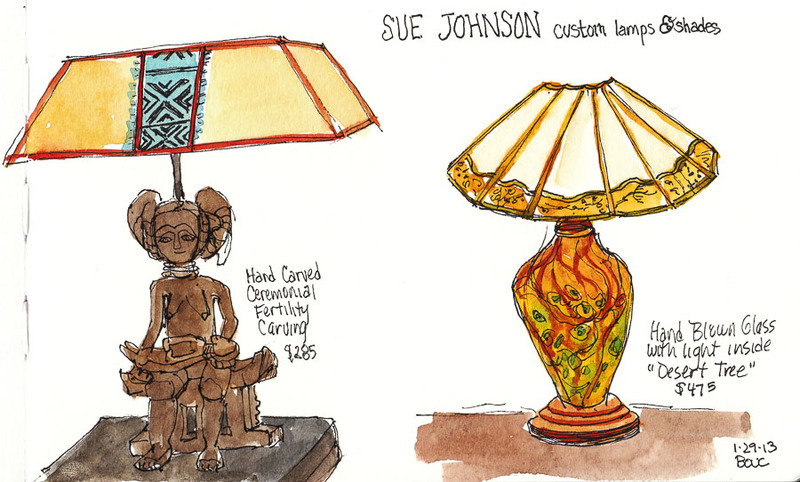 Last night our sketch group visited Sue Johnson Lamps in Berkeley, a shop that has specialized in custom, artisan-made lamps and shades since the 1970’s. Sue generously held the store open late for us and even offered us tea and persimmon pudding. We all fell in love with their amazing variety of hand-crafted works of art that also happen to light up. A good example of the variety: on the left above, a “ceremonial fertility carving” of a mother with big hair and a (very stiff) baby on her lap and an exquisite hand-blown glass base that lights up from inside with a shade embellished in lovely Japanese print fabric. 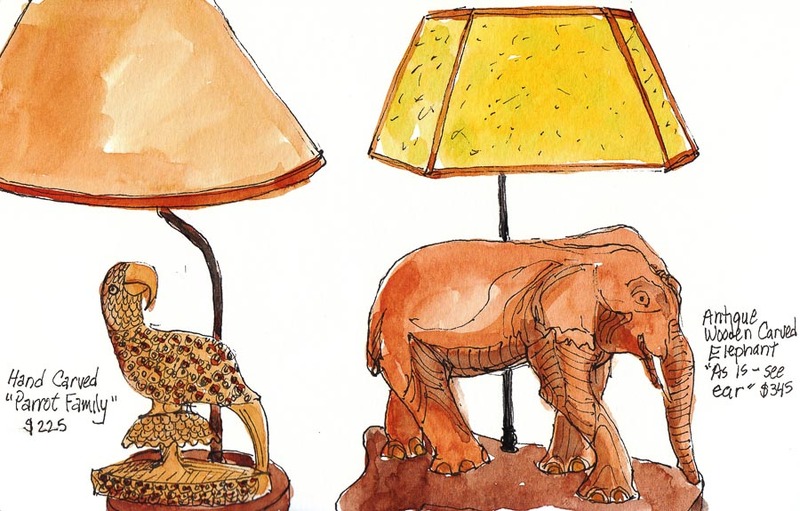 And then there was a whole menagerie of animal lamps: birds, elephants, dogs, monkeys, frogs and more. Sketching the elephant made me realize how much I didn’t know about what elephants look like. 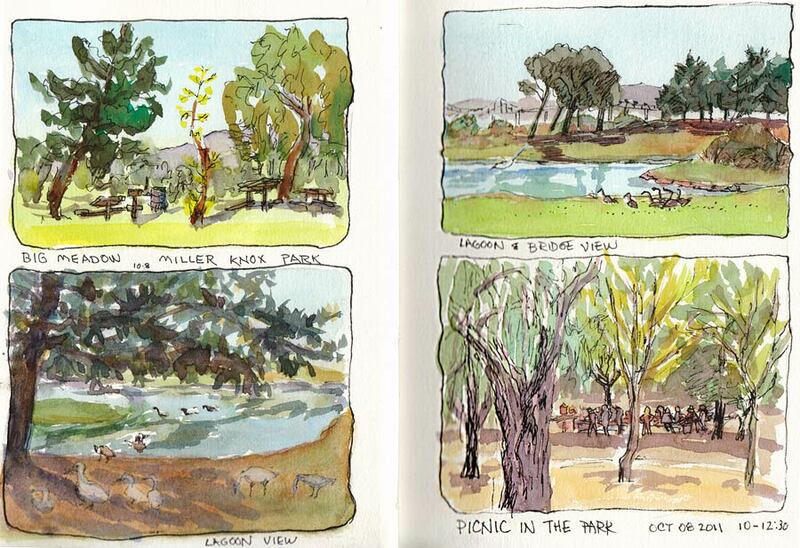 I hope we’ll be invited back again because there is so much more there to draw. 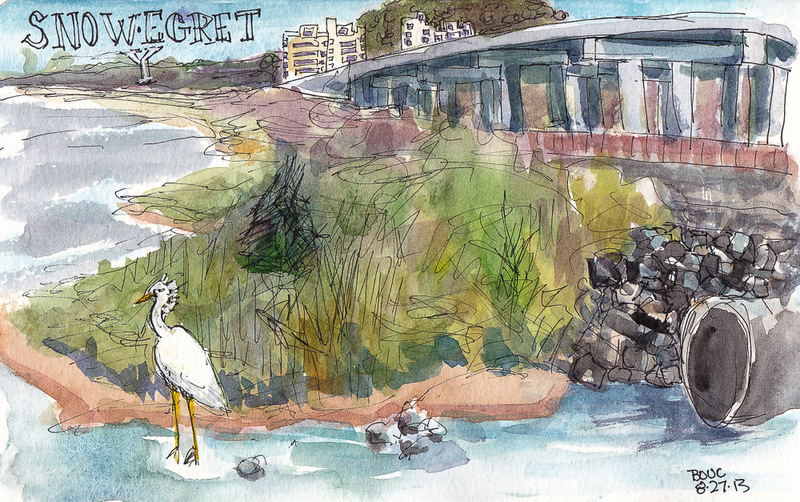 Be sure to see my sketch buddies’ very different drawings on our Urban Sketchers blog: see Cathy’s, Ceinwen‘s, Sonia’s, Cristina‘s, (and I’ll add links to Susan’s and Micaela’s when they get them posted). We are having the most glorious Indian summer this October, with nicer weather than we had during the real summer. I always think of this hot, dry weather as Earthquake Weather because of the earthquakes and fires during other hot Octobers. And sure enough there have been several earthquakes the past week. 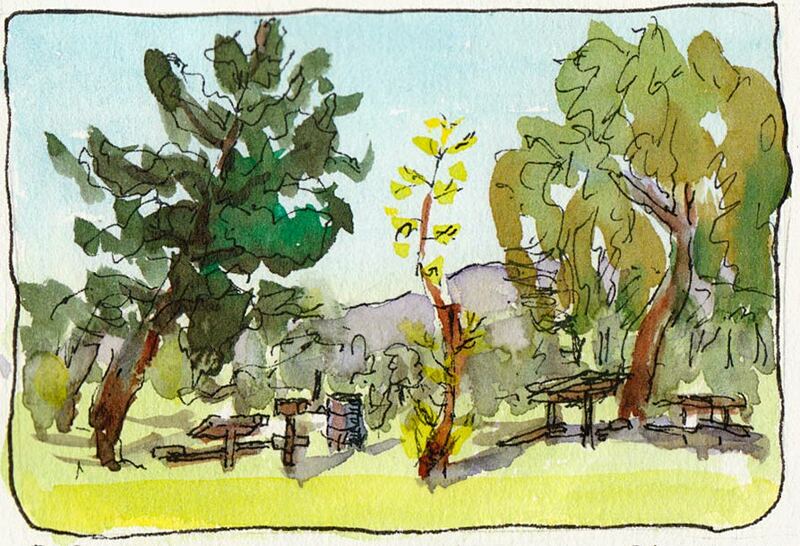 When I arrived at Miller-Knox park for a plein air group paint out at 10:00, I decided to sketch the first thing I saw: this little tree. 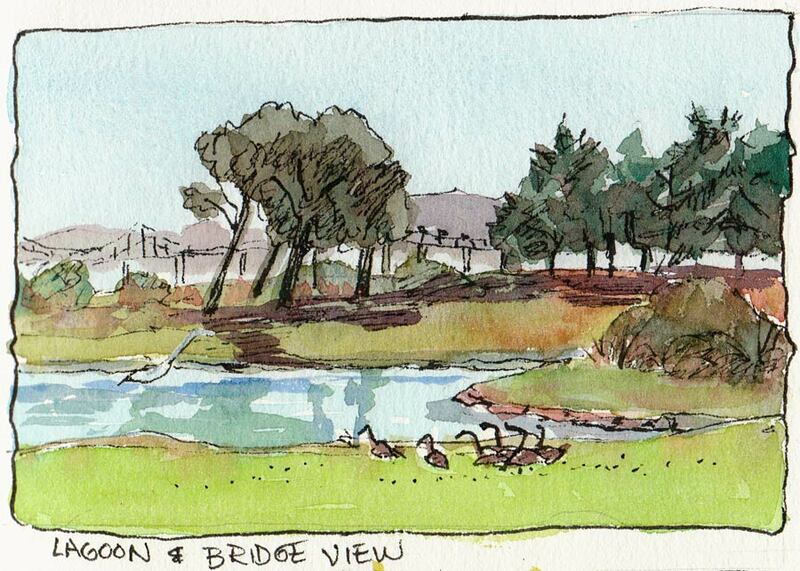 I sketched from where I parked my car. At the end of the paint out, when we returned to the parking lot, everyone was laughing at the dope who parked their car all wonky and it was my car they were pointing at. Apparently in my enthusiasm to get sketching, I managed to park at such an angle that I went around the cement parking stop blocks, ending up half on the grass and half in the next space, none of which I’d noticed doing. 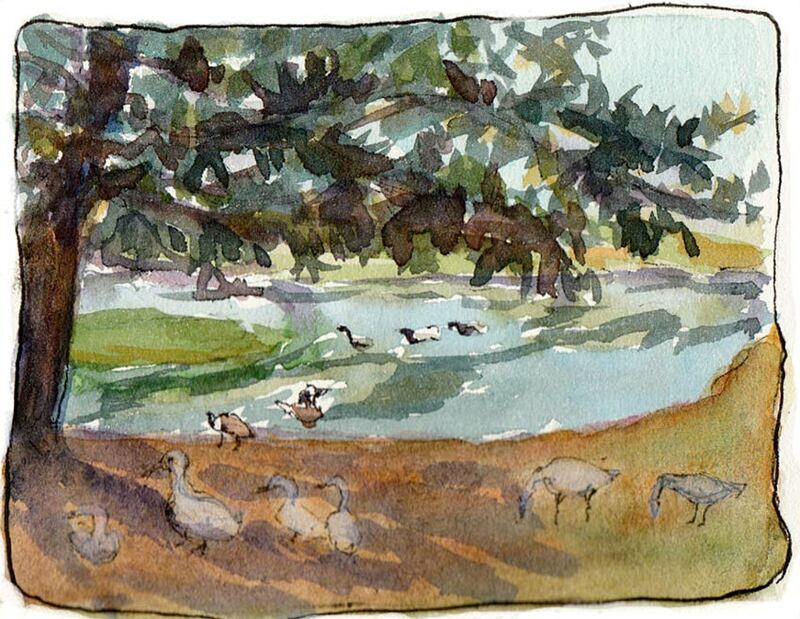 I took a walk and found a nice spot in the shade with a view of the lagoon and lots of white geese and Canadian geese. 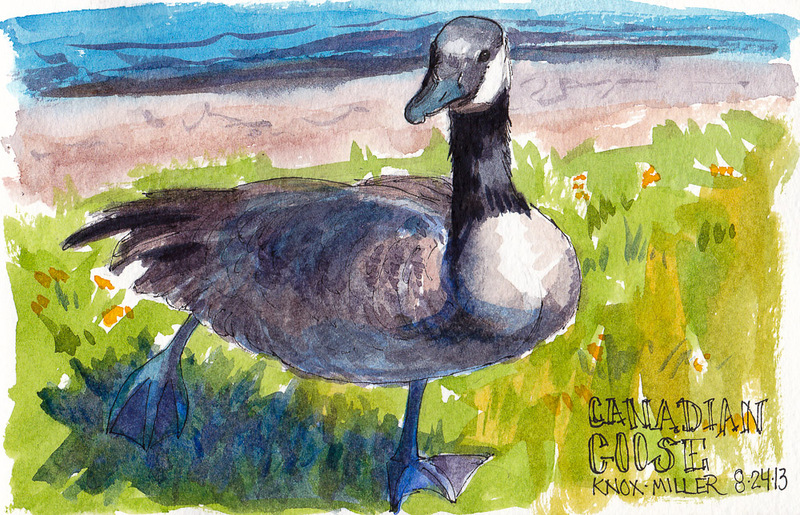 I lost the white geese when I repainted the shaded area so later added some white watercolor (which never quite works) to try to get them back. 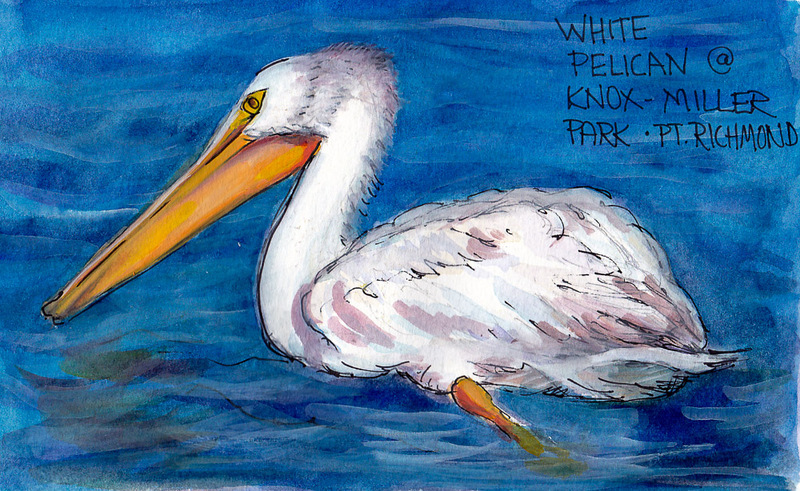 Since they’re in the shade, it’s OK that they’re not super white. 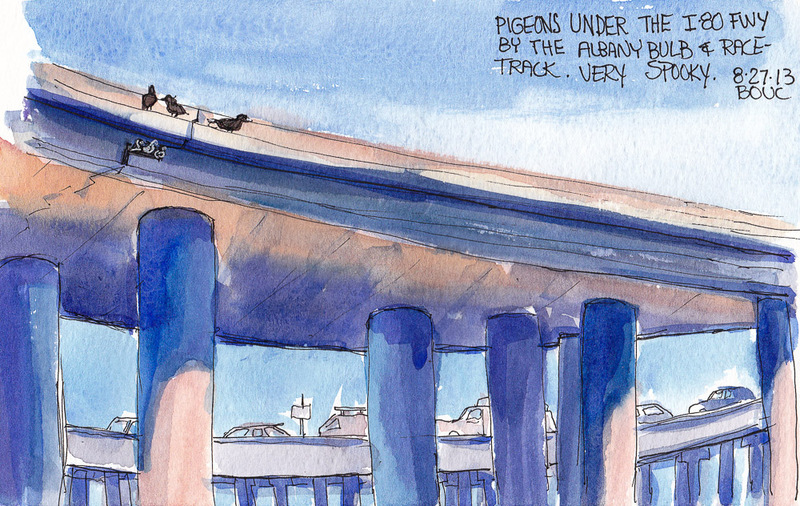 In the Bay Area you can be in a stunningly beautiful park but have views of freeways or bridges in the background that remind you you’re still in an urban area. 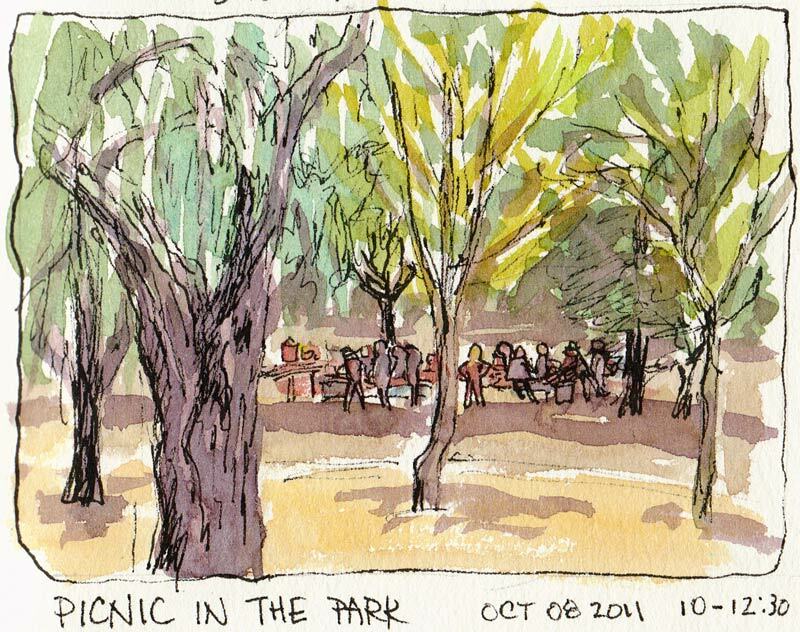 My last sketch of the day was of these folks setting up a picnic under the trees. 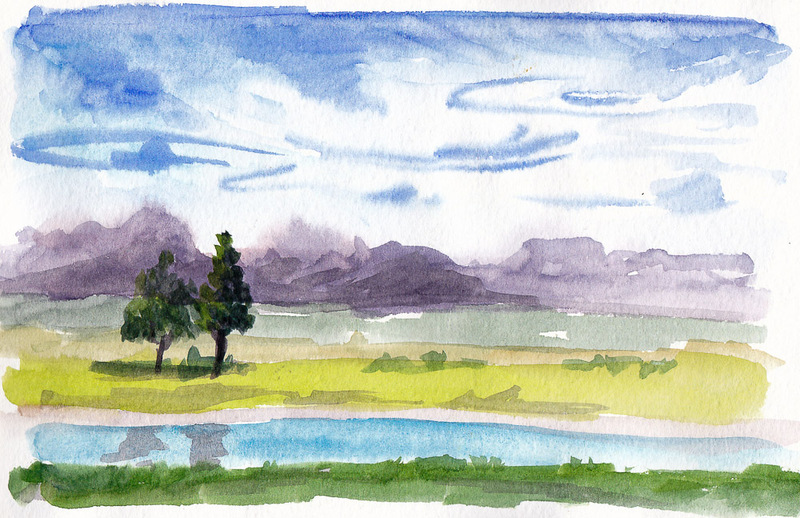 This was one of those days when the weather was perfect, the scenery beautiful, and my pen and paint just worked. 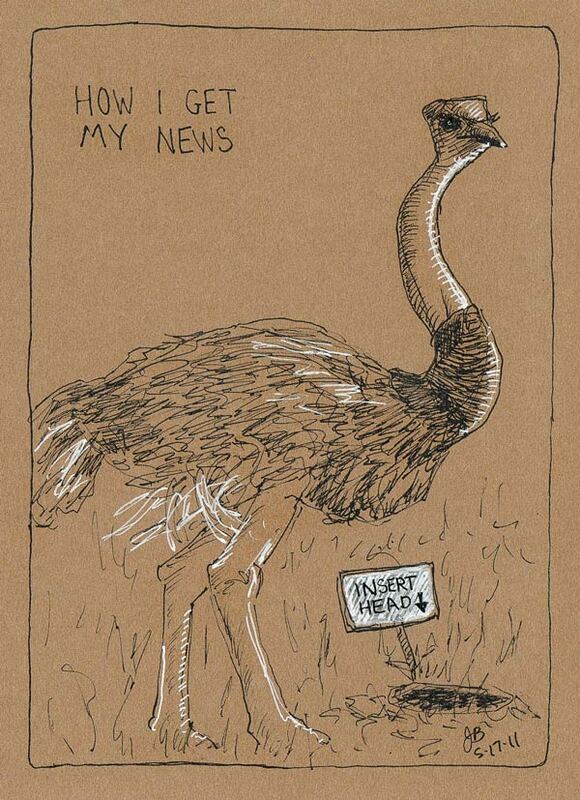 One of the Everyday in May drawing cues is “Draw How You Get Your News.” The image that immediately came to mind was an ostrich with its head in the sand. I am the opposite of a news junkie. I cancelled my newspaper subscription years ago when I realized it made me cry nearly every day. TV news is even worse, with “If it bleeds, it leads” as the guiding principle. So I just stick my head in the sand instead of consuming all the fear-based media, and do what I can to create better news. Avoiding the news means I can continue to believe that most people are mostly good and that it’s great to be alive. About the paper: Stonehenge just started making their wonderfully soft drawing paper in this color called “Kraft” except unlike regular Kraft paper it’s archival 100% cotton. It’s fun to draw on with black ink and white gel pen. 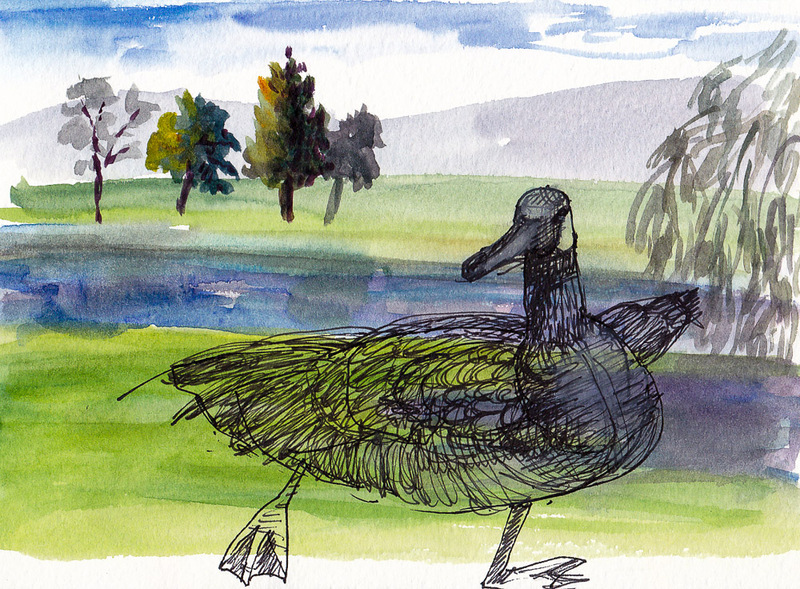 About ostriches: They don’t really bury their heads in the sand. 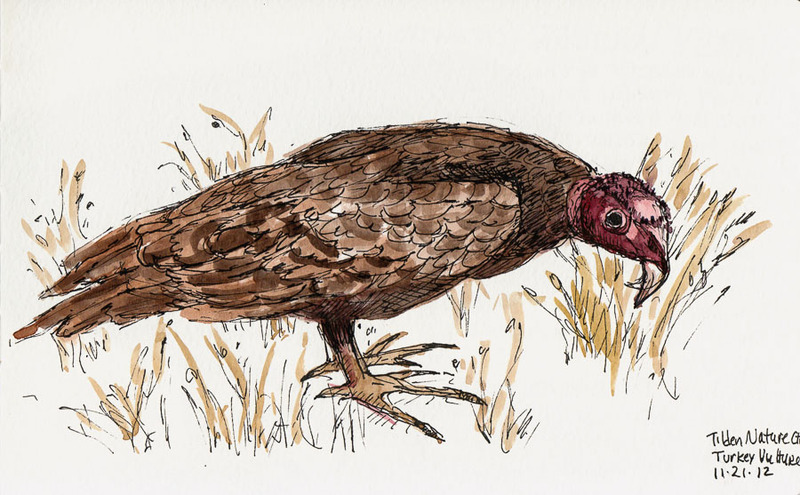 When frightened they try to hide by lying low and pressing their long necks to the ground which could look like they have buried their heads in the sand.